Sometimes you can just hear the Lord chuckling with you. Saturday morning greeted me with a bright surprise. About a week ago, our family had set up a birdbath (see previous post) and asked the Lord to invite all the birds to come to our garden and know it was a safe place for them to be. That morning, as I stepped out onto our deck to feel the cool air, I flushed a pair of MALLARD DUCKS out from under it. No kidding. 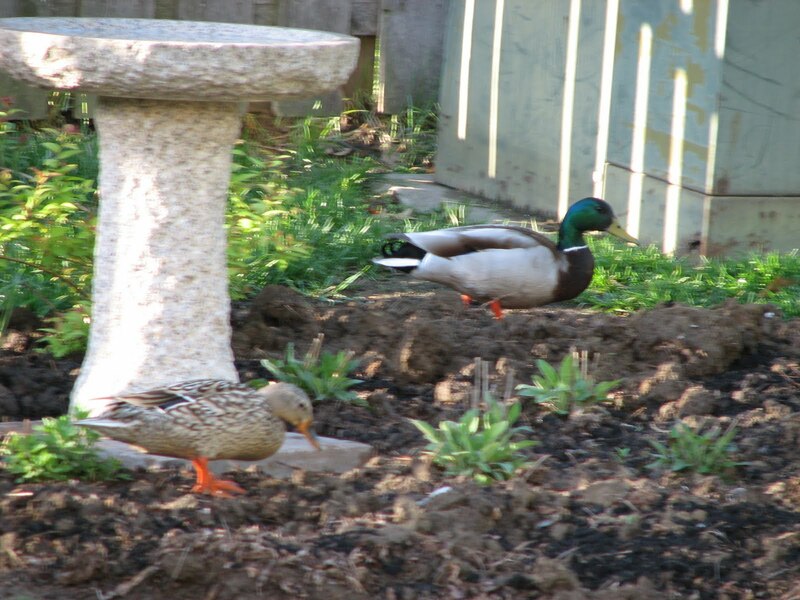 They promptly started walking out of our yard, and happened to pass by the birdbath as they went. I wildly snapped a few photos with my camera as I brimmed with the excitement of seeing such an unusual answer to our prayer. We’ve not seen so much as a duck feather in the five years we’ve lived in this city-bound neighborhood. There’s no reason for them to be here, except a spiritual invitation, made in love. I cherish the visit as a smile directly from the face of God, and a reminder that our prayers are powerful and precious to Him. This entry was posted in Kris' Heart and tagged birdbath, ducks. Bookmark the permalink. Love this! And the Sabbath rest invitation inherent in your birdbath. Wonderful!